Originally from Chicago, Finnian MacManus is a concept artist based in Pasadena, CA. His clients include VSA Partners, Easley Dunne Games and Sony Santa Monica Studio. MacManus works in a digital mixed-media approach, combining digital painting in Photoshop with CG modeling in Cinema 4D and Vue. He has a nice touch for creating environments and structures with an organic feeling, particularly in a series dealing with structures made from coral. He often renders these, and other subjects, in atmospheric hazes, imparting depth and mood. He sometimes works collaboratively, and I have likely included some collaborative work here without having the time to list individual attributions. Categories3d CGI, Concept & Visual Dev. Inspirations is a beautifully realized and wonderfully conceived short CGI animated film by Cristóbal Vila. On his website, Etérea Studios, Vila provides information about the short, including stills and annotation about the sources of objects and concepts used in the film, and a page about the referenced artworks by other masters. I particularly enjoy the highpoint of the piece, in which one of Escher’s images that suggests three dimensionality emerging from a flat surface, itself emerges from a flat surface. Vila also created the beautiful short, Nature by Numbers, which I wrote about here. Pythagasaurus is a wonderfully realized CGI animated short about “…the Mighty Pythagasaurus, the fabled tyrannosaurus practiced in the skills of trigonometry and long division”. The short is directed by Peter Peake and animated by Pascale Bories, with wonderful voice characterization by Bill Bailey, Martin Trenaman and Simon Greenall. Not exactly what you would expect from the preview images (grin). As someone who very much enjoyed Dave Stevens’ comic book The Rocketeer, and the Republic Pictures 1950’s Commando Cody serials, to which Steven’s character was a loving homage, I couldn’t help but like 3-D animator Joe Banana’s The Rocketeer 20th Anniversary, which is in turn a homage to Steven’s character and the underrated 1991 Disney live action movie adaptation (a homage to a homage to a homage?). Banana, who is co-creator and animator of the berserk game characters the RABBIDS, has created his delightful interpretation of the Rocketeer character done as a 3-D animated feature or TV show, giving us just enough of a taste to make us hope that Pixar will take the hint. Codehunters is a 2006 CGI animated short directed by Ben Hibon, who directed the animated sequence in the current Harry Potter and the Deathly Hallows movie. 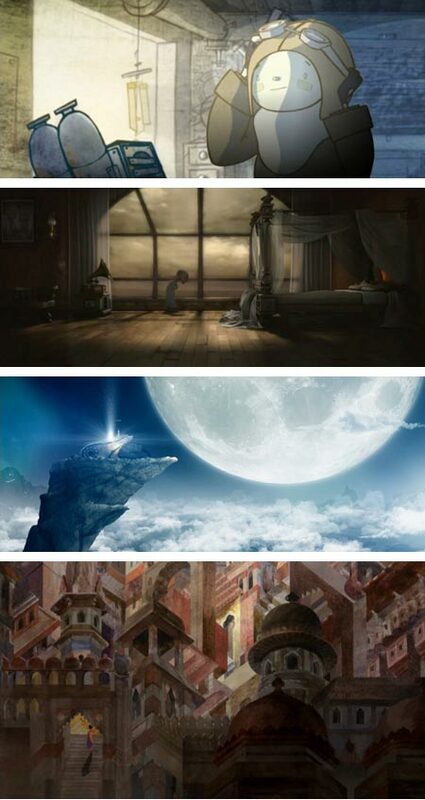 Working with Stateless Films and Blinklink, Hibon worked to make the CGI images look graphic and closer to 2-D drawings than most CGI, and the film has a nice blend of anime style and more rendered imagery. The story, such it is, involves some kind of dystopian setting, and doesn’t make a lick of sense as far as I can tell. There is an explanation of sorts here, but it’s too boring for words. Of more interest is the page on CGSociety in which there is a discussion of the film, which was originally made for a weekly MTV Asia TV show called Screen, and meant to be a prologue for a longer work that was never developed. Listicles, part of The L Magazine from New York, is a blog for which every post is a list of some kind, has posted an interesting list of 10 Surreal Animated Short Films. These are culled from various sources (including the Goeblins Annecy animations) and are a mix of hand drawn and CGI animation. All of them are interesting, and collectively make for a good bit of amusement and fascination.